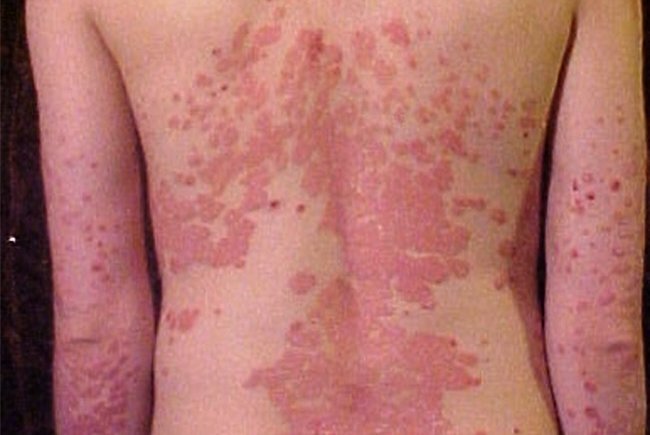 Psoriasis is an autoimmune disease that causes painful, thick red patches on the skin that may bleed or itch. People who suffer from chronic condition also suffer from stigma around the noncontagious disease. More than half of Americans surveyed said they would not date someone who had psoriasis, says new research from the Perelman School of Medicine at the University of Pennsylvania. Thirty-nine percent said they would not want to shake hands with someone suffering from psoriasis, while 32 percent said they would not want someone with the disease in their homes. The new interdisciplinary research, published Thursday in the "Journal of the American Academy of Dermatology," is the first of its kind to examine the pervasiveness of the stigma against those with psoriasis – a chronic, autoimmune disease that causes painful, thick red patches on the skin that may bleed or itch. “Although it’s widely recognized that the appearance of psoriasis can negatively impact patients’ social, professional and intimate relationships, we wanted to quantify the perceptions patients with psoriasis face on a daily basis in order to understand how pervasive they are,” said the study’s senior author Dr. Joel M. Gelfand, a professor of dermatology and epidemiology at Penn, in a news release. Using Amazon Medical Turk, a web-based data collection service, researchers showed participants images of people with psoriasis as well as close-up photos of psoriasis lesions. Of the 198 people who responded, 53 percent believed those with psoriasis were sick, 57 percent considered them to be insecure and 45 percent said they were unattractive. Though the disease is not contagious, nearly 30 percent of participants said they believed it was. Rebecca Pearl, an assistant professor of psychology in psychiatry at Penn and lead author of the study, said better education will alleviate social stigma surrounding the skin condition and that contact with persons with psoriasis may help "dispel myths and stereotypes and reduce negative perceptions." In fact, less stigmatized views did emerge when the survey presented the same images of psoriasis and those affected by the condition to 187 medical students. Similar trends were found in web-based survey participants who knew someone or had heard of someone with psoriasis. “Future studies should evaluate the effects of education campaigns on people’s attitudes toward those with psoriasis, as well as efforts to incorporate patients with psoriasis into general medical education for physicians and other health care providers,” Gelfand said. An estimated 7.5 million Americans – 2.2 percent of the population – suffer from the condition, according to the National Psoriasis Foundation. When moderate to severe, the condition carries an increased risk of heart attack, stroke and premature death. Health costs associated with the disease are calculated at $11.25 billion, the foundation found. Researchers at Penn said that further research with a larger sample size is needed before any definite conclusions can be made, but that their findings do have implications for public health and patient care.